After almost one year of living at the Standing Rock campsite, Dakota Access Pipeline protesters are being forced to evacuate. After an emotionally charged few last months, and initially surviving through the change in presidential administration, they are leaving involuntarily because of a reason many would not expect – a flood warning. At least, that was the official reason. As the protesters were leaving, a few set fire to a few tents to make a statement, while others prayed, sang and danced. 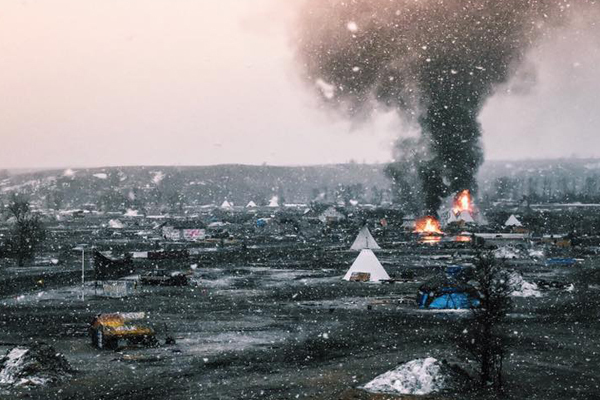 A haunting photo of their burning encampment was published in an article by Time Magazine, and now, the remaining 70 protesters have been cleared out by militarized and heavily armed police. 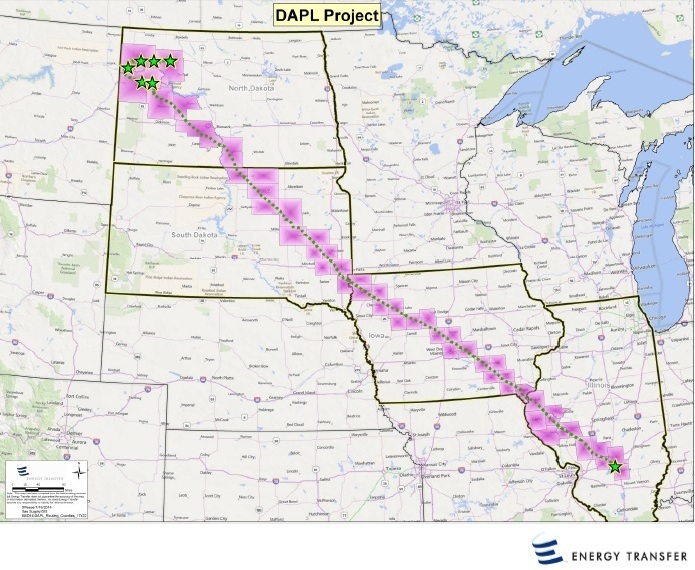 In December 2014, Energy Transfer Partners asked the government permission to build the 1,200-mile Dakota Access Pipeline that would carry half a million barrels of oil daily, through the Dakotas to Illinois. The pipeline was approved in March 2016. The pipeline was immediately left with opposition from the Standing Rock Sioux tribe, as its route crossed their land, and would pollute a Missouri River reservoir used as drinking water. Thousands of people have been protesting since April 2016, tribe members and supporters, and have set up a camp. Between April and August 2016, more than 600 arrests have been made, including actress Shailene Woodley and Green Party presidential candidate Jill Stein. In November 2016, protesters were tear gassed, shot with rubber bullets, and sprayed with water cannons in freezing temperatures. At least 17 were injured badly and required medical assistance in hospitals. In January 2017, the Army Corps began an environmental study of the pipeline that would take two years to finish. But on January 24th, President Donald Trump signed executive orders to advance the completion of the pipeline. The Army Corps halted their study on February 8th and the drilling began immediately. On February 17th the environmental review was terminated. Five days later, the protesters were forced to leave due to a flood warning. On February 15th, North Dakota Governor Doug Burgum signed an executive order for the protesters to leave the camp by 2 p.m. on February 22, 2017, citing a spring flood warning as the reason for the evacuation (most have ignored the November 28, 2016 evacuation order). Burgum wrote that the evacuation is “to reduce the threat to public safety, including the risk to life…” Because some protesters have been risking their lives during the cold weather and have faced the violent acts mentioned above (at least 17 people were taken to hospitals), the risk of injury or even death is nothing new. A few tried to stay despite this second evacuation order. Some have been arrested. The people who have evacuated had a choice to go to the Cheyenne River Sioux Reservation, bordering Standing Rock, which welcomed them in a video. Some protesters set fire to the camp before leaving. “This is the end for them. 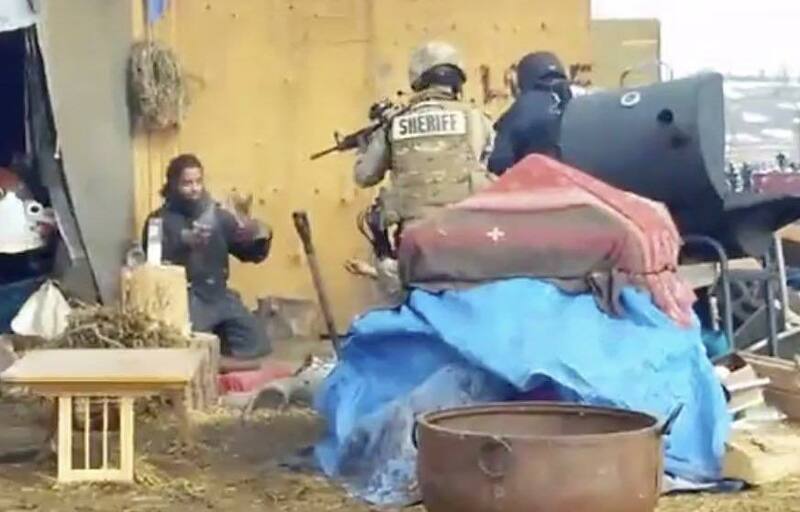 This is the closing down of the camp… They don’t want to give [the law enforcement] the opportunity to take stuff down; they want to do it on their terms; they are doing it ceremonially,” says an onlooker who live streamed on Lakota People’s Law Project Facebook page. Protesters had a lot of different reactions to the evacuation. Some prayed, others celebrated because they said they already won by waking up the world. A few burned down the camp to deny the authorities the opportunity to take it down. “People have said their last prayers, and offered cedar to the sacred fire and are also burning these structures we have ceremonially built, so they must be ceremonially removed,” said Vanessa Castle of the Lower Elwha Klallam tribe. Other protesters said they will not give up. Matthew Bishop came to North Dakota from Alaska in October 2016. He told Time that he is not going back home. “People have been surviving here for hundreds and hundreds of years … so if I back down, what would I look like?” he said. According to reports, as many as 47 people have been removed from the encampment in a “military-style takeover.” Armed police in riot gear driving military-style vehicles raided the camp, officially driving out the roughly 70 people who remained, while also bulldozing structures. What you see here is militarized police pointing an assault rifle, at point blank range, at an unarmed fire keeper tending the sacred fire. We are fully expecting law enforcement to accidentally lose or damage the media that has been confiscated, as the fascism of this country is beginning to come to face. Lawyers are already on the case. THIS IS AMERICA AND WE DO NOT FEAR OUR GOVERNMENT. “From this history, a pattern emerges wherein the United States consistently utilizes the legal narrative of the time to segregate, take from, and discriminate against Indian tribes. [The Dakota Access Pipeline] is simply the latest example of Native peoples of the Great Plains being subjected to varying legal standards and shifting political winds to justify the subordination of Indian treaty rights to non-Indian pecuniary interests. Tags: dakota pipeline, dakota pipeline facts, dakota pipeline fire, dakota pipeline news, dakota pipeline news obama, dakota pipeline trump, dakota pipeline trump investment, north dakota pipeline, north dakota pipeline protests, north dakota pipeline protests location, standing rock, standing rock arrests, standing rock burning, standing rock campsite, standing rock campsite closed, standing rock live stream, standing rock news video, standing rock protest facebook, standing rock update, standing rock update today, trump approves dakota pipeline, what is standing rock protest, what is standing rock protest about, and who started the dakota pipeline.